ive churches are currently visible on Bribirska Glavica, four in ruined state, cleared by various excavation teams between 1913 and 2016, and one still in use by the local Orthodox community, dedicated to Sts Joachim and Ann. The oldest of these is an octaconch rotunda building, the foundation of which is dated by an associated funerary context to a period prior to the mid-6th century, which might encompasse also the 4th and 5th centuries. Parts of this monument have been cleared in 1959 and 1967, when teams under Stjepan Gunjača’s supervision opened two trenches inside and bellow the floor of the church of Sts Joachim and Ann, which was built atop the rotunda, and outside this church, to the north of its naos. Since 2014, the systematic excavation of this monument and its annexes has been at the core of the Varvaria-Breberium-Bribir project. 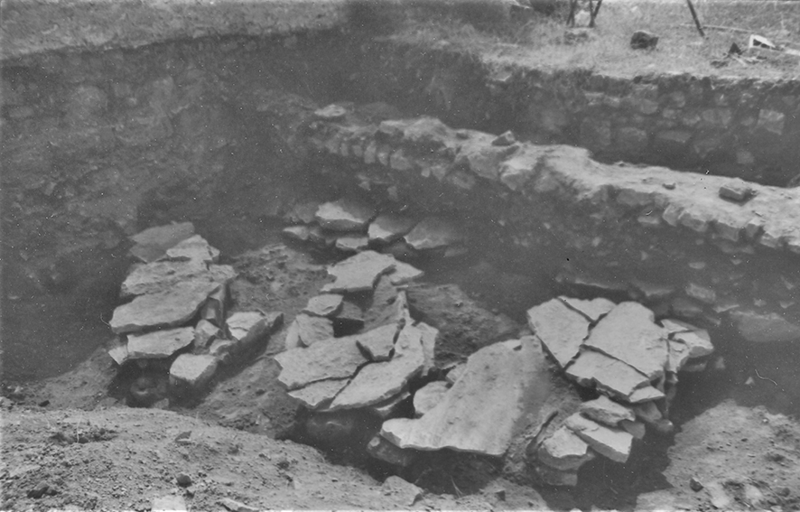 The last excavation seasons have thus revealed several interrelated structures belonging to what appears now to be an ecclesiastical complex, which remained in use very likely at least until the 11th century. Not far from the rotunda, which might have been used in the final stages of its use as the abbey church of St John the Evangelist, in the mediaeval period several new churches were erected at Bribir. 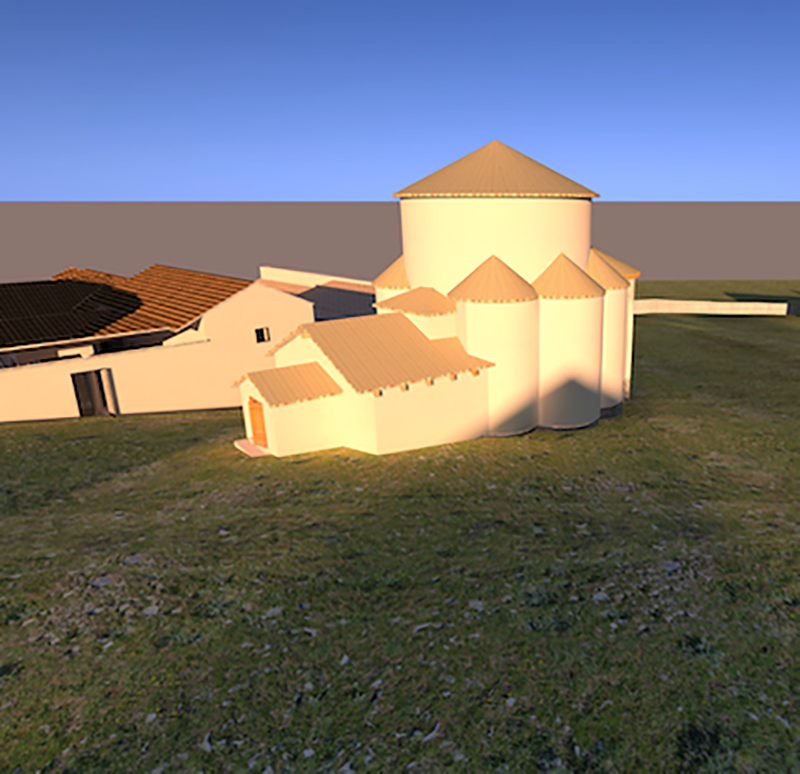 According to the current state of research, the earliest among these is a single-nave church provided with a semicircular apse, built in the area of the site known as Vratnice, alongside the north-western edge of the settlement. Cleared in 1913 by Lujo Marun, it features a typically Romanesque (12th-13th century) ground-plan, which finds numerous analogies in Dalmatia. 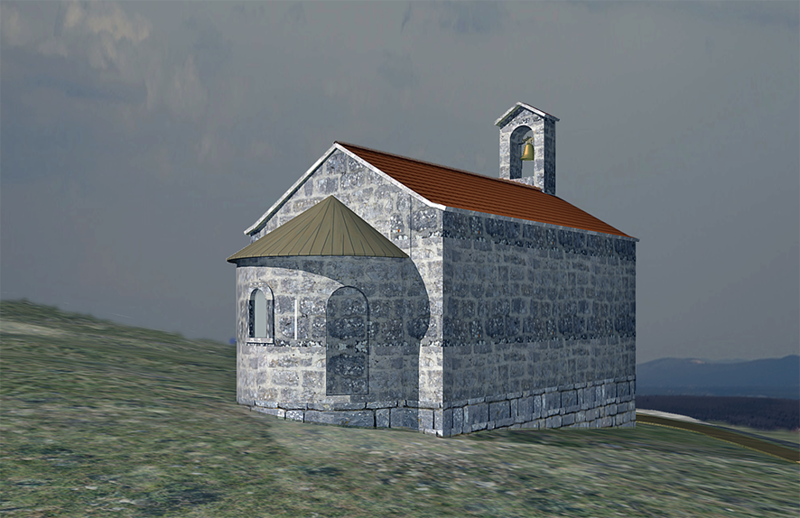 This small church was built intra muros, in the immediate vicinity of the eponym cemetery located outside the ramparts, which might suggest that it functioned as a cemeterial chapel. A similar function might be conjectured for a single-nave Gothic church featuring a rectangular apse, which was built in the Tjeme area, alongside a 12th-13th century cemetery and today’s local graveyard. Historical documents mention numerous silver gilt liturgical vessels that were gifted over the centuries to the Bribir churches, particularly the one dedicated to St Mary, belonging to the monastic complex of Dol. This is the only ecclesiastical building of the whole archaeological site that has been completely investigated and conserved. 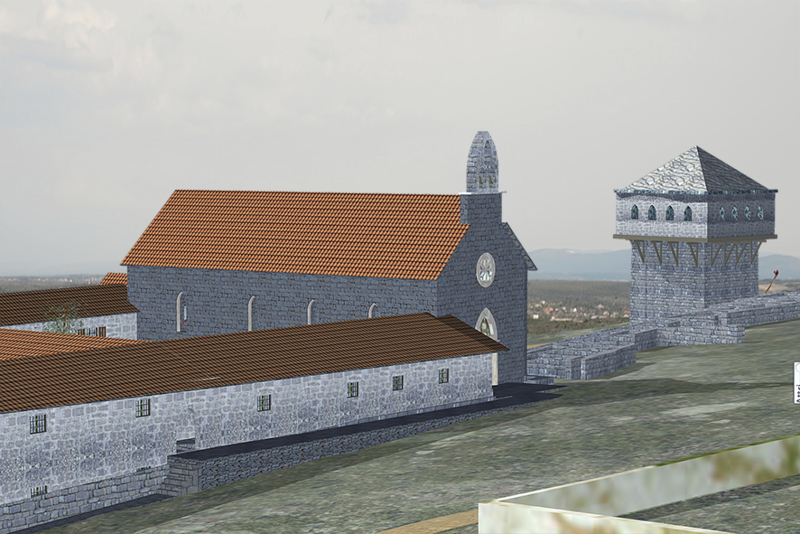 The exact date of its construction is not known, but it is likely that is should be situated around 1300, during the governorship of Paul I Šubić († 1312), for his son, Paul II († 1346), required in his will that his body be interred “in Bribir, in the church of St Mary, in the grave where his father and sons are at rest”. It is clear that this church sheltered the mausoleum of the Šubić family. Its keeping and the governance of the monastery were confided to the Franciscans, and this Bribir convent is also the oldest in Croatia (outside the Dalmatian cities) that belonged to this order. During the 15th century, the church of St Mary was repaired and extended a number of times. In 1415, the Šibenik master craftsman Petar Radmilov added some vaults, and in 1440 and 1447 the Zadar builder Vidul, son of Ivan, contracted with the dukes of Bribir to remodel the church and to extend the Chapel of St John, who, along with the Blessed Virgin Mary, was the patron of the Šubić family. In 1452, Vidul’s sons signed a contract to have the roof of the church re-tiled. 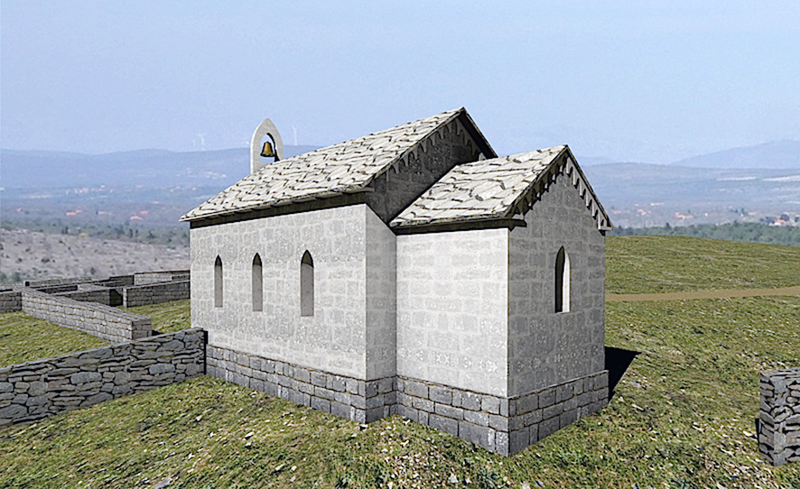 The church of St Mary’s was without doubt outstandingly appointed, as shown by the numerous architectural elements found during the excavations. Both the church and the monastery, like the major part of Bribir, suffered badly during the time of the Turkish conquest, in 1523. Previously, the valuables of the Bribir monastery, including a wooden Gothic statue of the Virgin and St John, silver gilt reliquaries, documents and part of the monastic library, had been transferred for safety to the Franciscan monastery in Šibenik. Today’s church of Sts Joachim and Ann, used by the Orthodox congregation, is probably the most recent Christian building on the Bribir plateau. It was erected in two phases, the last of which, represented by the addition of what is now a pronaos, predates the end of the 14th century. A cemetery developed around this church at an early stage and has been in use until today, when both the church and the graveyard cater the inhabitants of the modern village of Bribir located at the foothills of Bribirska Glavica. ive compact premodern cemeteries have been, to date, identified and researched on the Bribir plateau and on its slopes. The funerary material associated with the graves therein constitutes the largest body of data pertinent to the study of both the chronology of the site and the material cultures that succeeded one another at Bribir. These cemeteries span a period of roughly eight centuries, starting from the late 8th or early 9th century to the second half of the 16th century, after the Ottoman conquest of Bribir. The pre-Roman and Roman funerary areas have not yet been identified. 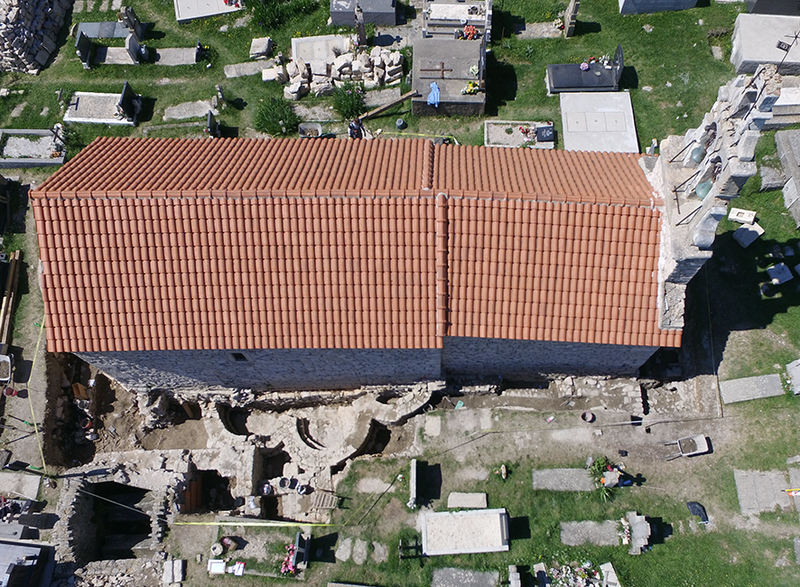 Only six late antique graves have been excavated so far, in the cemeteries of Vratnice and, in 2015, at Groblje, under the modern church of Sts Joachim and Ann. The oldest burial sites are located outside the city ramparts, at Vratnice and Novi put. 123 graves have been identified and studied in the Vratnice cemetery, which indicates that this burial area was the main one of the castrum during early mediaeval times. The grave goods found in 64 of these graves, essentially jewellery and particularly earrings, situate the utilisation of the cemetery between the late 8th or early 9th century and the late 10th century. The oldest burial sites are located outside the city ramparts, at Vratnice and Novi put. Only 13 graves have been identified in the small cemetery of Novi put, on the eastern slope of the Bribir hill. Its use seems to span the period between the end of the 8th century and the 11h century. During the 12th and 13th centuries, the cemetery of the castrum was moved within the ramparts, around the rotunda church. Known in specialised literature under the name Groblje, this proper graveyard has been only incompletely examined in two large trenches opened in 1962, 1963, 1965 and 1966 along and outside the southwest and southeast sides of today’s village graveyard, as well as in two smaller trenches dug inside the modern graveyard. This mediaeval funerary area superposed itself, at least partly, on what appears now to be a much earlier, late antique burial site, the first elements of which have been unearthed in 2015 by our Project. 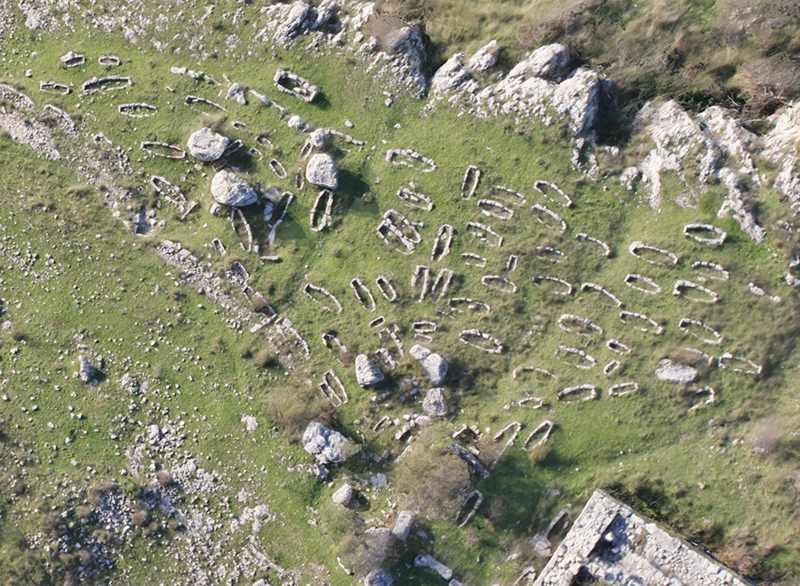 Although used perhaps uninterruptedly, certainly in the 5th or 6th century and between the 10th and 15th centuries, Groblje becomes in the 12th/13th the only cemetery at Bribir. 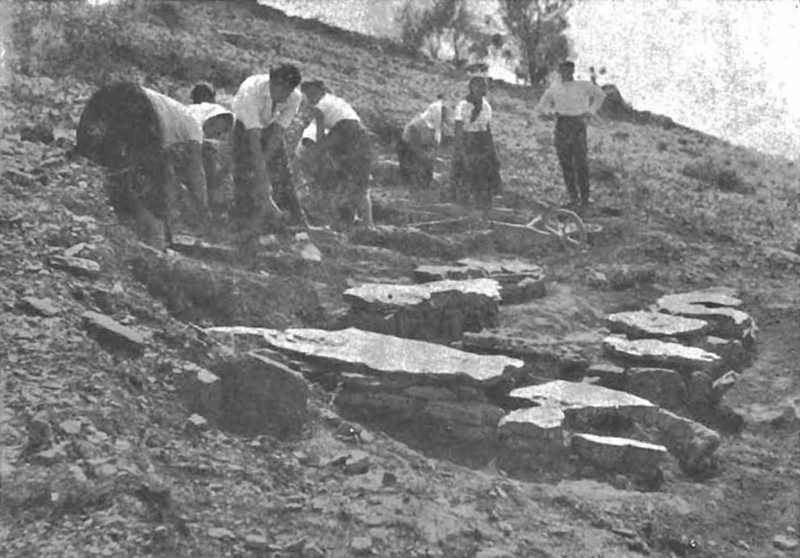 The cemetery of Tjeme, excavated in 1967 and covering the higher layers of the southwestern part of the Groblje graveyard, alongside the southwestern wall of today’s village graveyard, is associated to the Gothic church of Tjeme. As the church itself, it appeared likely in the 14th century. Although few of the 78 graves identified therein contained datable material, three-bead filigree earrings confirm this terminus. Other metal artefacts indicate that the cemetery was in use until the Ottoman conquest of Bribir, in 1523. One notes also in this burial area two- or three-storey graves, which emerge in the Dalmatian funerary repertoire in the 14th century. Around and inside the church of St Mary, at Dol, built at the beginning of the 14th century, a large cemetery developed, of which 172 graves have been excavated. As the cemetery of Tjeme, it will be in use until the Turkish conquest of Bribir. The graves in this area feature a remarkable formal diversity. If the graves located around the church are simple, covered with small stone slabs, inside the conventual church they are elaborate, double- or triple-decker graves – introduced in the 14th century – concealed by monolithic stone slabs typical for the 15th and 16th centuries. 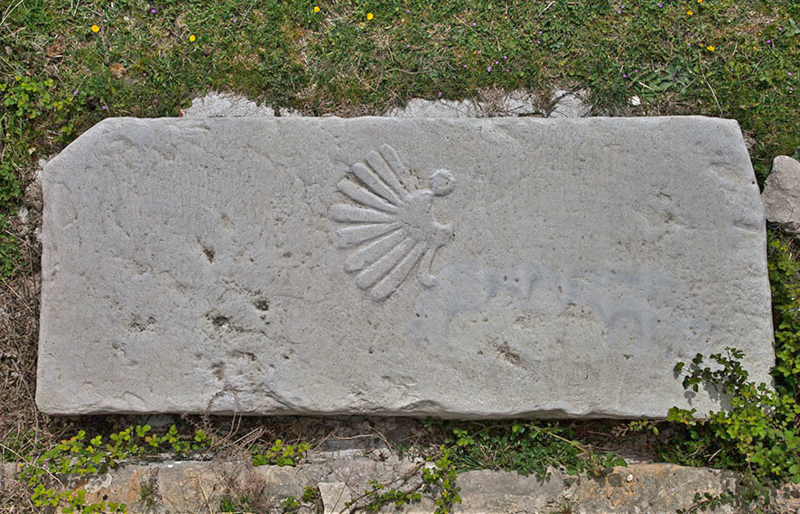 One such multi-storey tomb, situated alongside the northern wall of the narthex, is covered by a massive slab on which an angelic wing is carved in relief, of the type featured on the coat of the arms of the Šubić family. 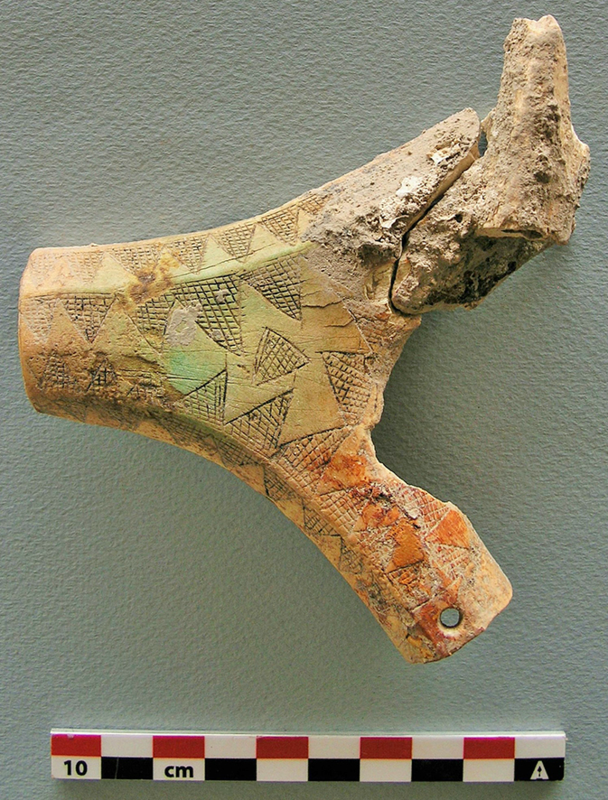 In the narthex, a finely carved Gothic capital was retrieved during the digs, which contains the same heraldic sign, and it can be presumed that the mausoleum of the Šubići was lying there, under an arcosolium. Together with their respective positions – inside or outside the church, or inside the monastery –, the varied architecture of the graves denotes social stratification. The finds of jewellery coming from the graves at Dol show characteristics of the goldsmith trade characteristic of the Gothic period. Most often, they are filigree three-bead earrings and cast signet rings, sometimes with an inset stone. Among the blacksmith-made objects, one notes iron mushroom shaped belt buckles, spurs and a sword typical of the 13th century. Groblje cemetery. Antler salt container discovered in a reused late antique grave, below the modern church of Sts Joachim and Ann. Dol cemetery. Slab covering the tomb of the Šubić family in the church of St Mary.